Thanks to all of you who visited the VIT ceramics booth at Dwell on Design in June! This year, I exhibited the VIT collection in white and it was very well received. 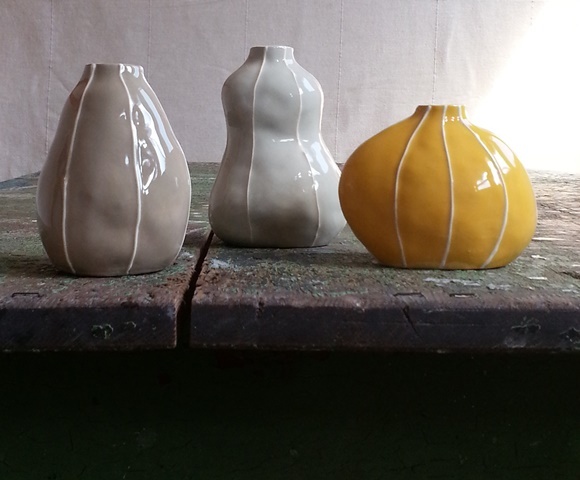 I also felt a strong response to the handmade element of VIT ceramics. Today we are surrounded by technology and super refined, highly produced, objects. Though definitely not undesirable, it seems that in response to so much tech, we are becoming more attracted to handmade objects and the beautiful irregularity inherent in artisan-crafted pieces. Dwell on design gave me the opportunity to witness, first hand, the smiles on peoples as they entered the Kri Kri Studio booth and relaxed, surrounded by handmade ceramics. 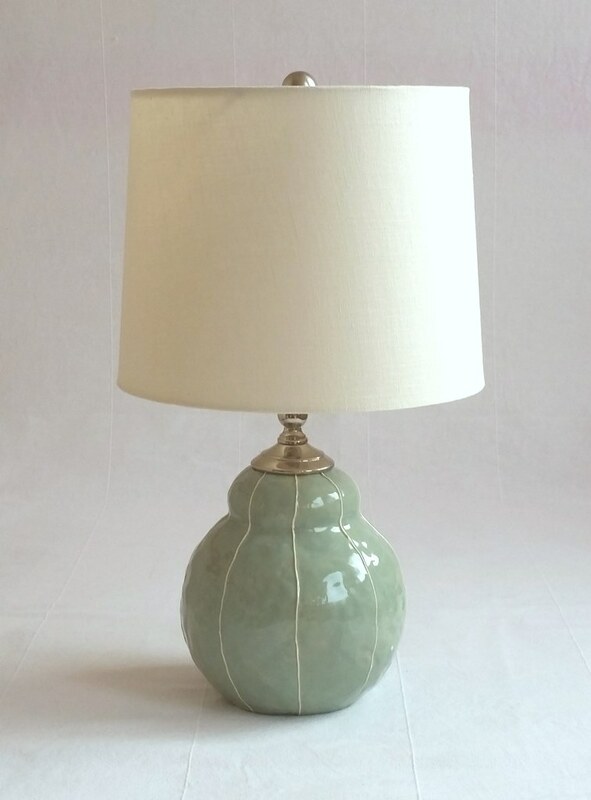 Along with introducing white to my range, I started using a vintage style, white twist cord with the VIT ceramics lamps. This carries through with the thin white stripe detail and creates a more polished product. I love the texture and the way this cord drapes! Also New: The Bubble Lamp; Transformed with a drum shade, this small piece is ideal for bedsides, entry ways and cozy spaces! A busy summer has made for an exciting Autumn! 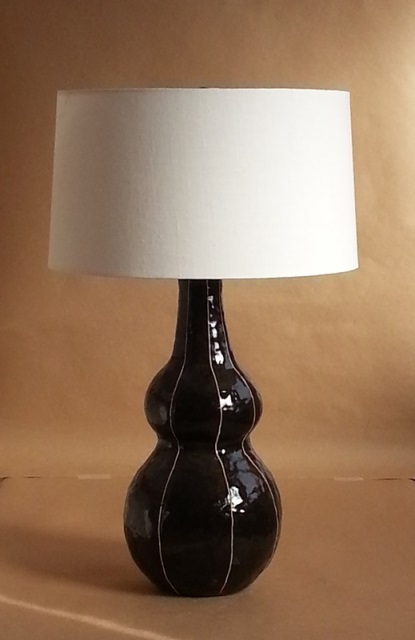 I am now working on samples of lamps and vases using my new color, “Chocolate brown”. For a look at these delicious options, visit Kri Kri studio on Instagram . 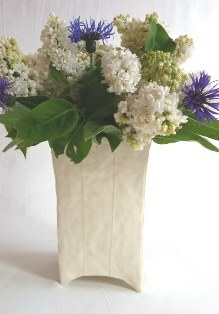 Newest in the vase range is a Tall Square vase. Both elegant and quirky, this shape can stand on its own holding a bountiful bouquet. Used in pairs, the Tall Square vase creates balance and drama on mantles and sideboards. I look forward to filling a chocolate version with fall colors! Wishing you all a stimulating transition into the new season! I am always on the alert for unexpected beauty and props that can be used in my photo shoots. 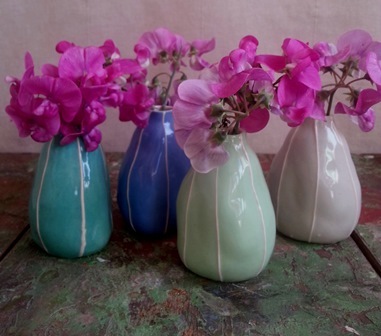 In August it was clumps of wild fennel and rampant hot pink sweet peas that caught my attention. These hardy plants, plucked from the urban jungle, threaten to look more like weeds than botanical inspirations at times. However, the bright shock of pink and simple yellow-green sprays of seeds were perfect elements for highlighting my organic shapes. I utilized them over and over again. The more time I spend photographing my work the better I come to know and understand what it is that makes them special. I see how surfaces respond to different lighting conditions. I also take note of how glaze colors interact with a variety of flowers and foliage. I grow to appreciate the irregularities of each handmade form. This past spring I began posting images regularly on Instagram. The discipline started as a necessary task. These days posting is a satisfying activity, like making a daily journal entry. It is a time for me to slow down and take a moment to see and think about what is beautiful in my work. It is my reward for sweating over it day after day! Kri Kri Studio | Dwell on Design. 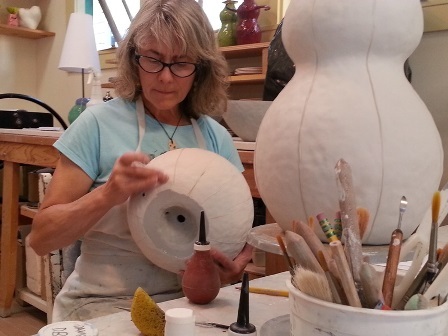 The last weekend in May, kRI kRI stUDio, goes on the road, to LA, with her lamps and vases. Come see it all, in person! The Dwell show is always stimulating and inspiring! One of the first things I notice is that items that are not machine made seem to stand out from the crowd of other objects in a room. Regardless of how skillfully it is made, the handmade object has a life of its own. A handmade piece of cloth, or a painting versus a print, can completely change how a room feels. I could say, “It adds warmth.” But what is that “warmth”? Every item that has been hand crafted captures some of the human energy that went into making it. That is something that can’t be replicated by a machine. That is the “warmth”. 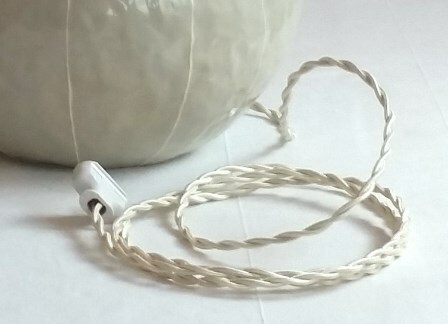 An item made by hand is tactile. Primitive or not, that item contains a spirit and becomes a manifestation of our creative potential. Having artisan made objects around me gives me inspiration, indirectly. They do not make me feel that I need to create. Instead, I feel more connected to my human-ness in a comforting way. A handmade object is imperfect. Perhaps that makes it more relaxing to be around. We are not perfect beings either. Subtly, one is reminded that there is beauty or at least charm in the irregular. Those who love crafts have come to appreciate those inevitable flaws. It is my belief that handmade objects do add value to our lives. As technology continues to play a bigger role in our lives, it is important to remember how much our hands can do and discover. Handmade connects us to other humans in a sensual way. Handmade reminds us that we are creative beings, with flaws. Could it be possible that having more handmade objects in our lives might nudge us to be more accepting of ourselves and our human imperfections? Can those faults be quirks and considered endearing traits and characterful? More to ponder! Rather than make a new years resolution, it has become my custom to instead select a motto to rally me for the coming year. This one came to me just before mid-night in a fortune cookie at the New Years Eve party. I think it was the best one of the bunch and one worth sharing. “Be yourself. No one is more qualified.” How do we do this? As an artist, this statement is particularly meaningful as far as my work is concerned. I am always trying to understand and define my own style. It is easy to get distracted by creativity all around, many ideas and so much possibility. It is not difficult to lose focus and confidence in what one does. Part of what this year’s motto says to me is, enjoy and appreciate the work of others, but don’t under-value your own efforts. I continue to look at my ceramics to decide what the strong points are and find the essentials. Focus on the positive. Trim away the superfluous. This works for the self too. 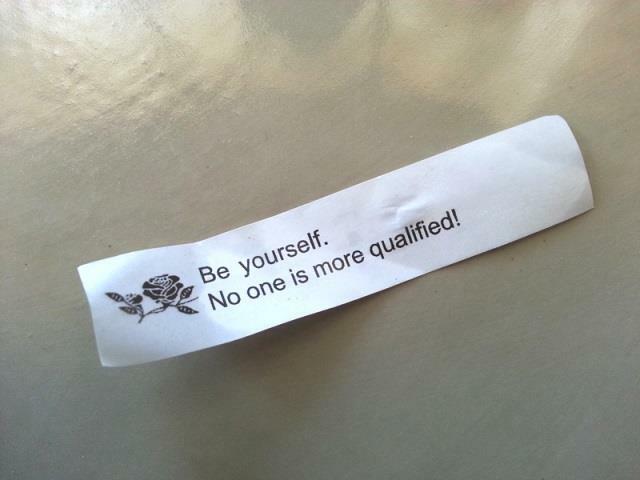 The fortune cookie message also suggests that if I define and follow my own artistic sensibilities and can be myself, I will be happier. In 2015 I am taking time to see the best of what I do and who I am, and will try to do it better. Now, that’s starting to sound like a resolution! 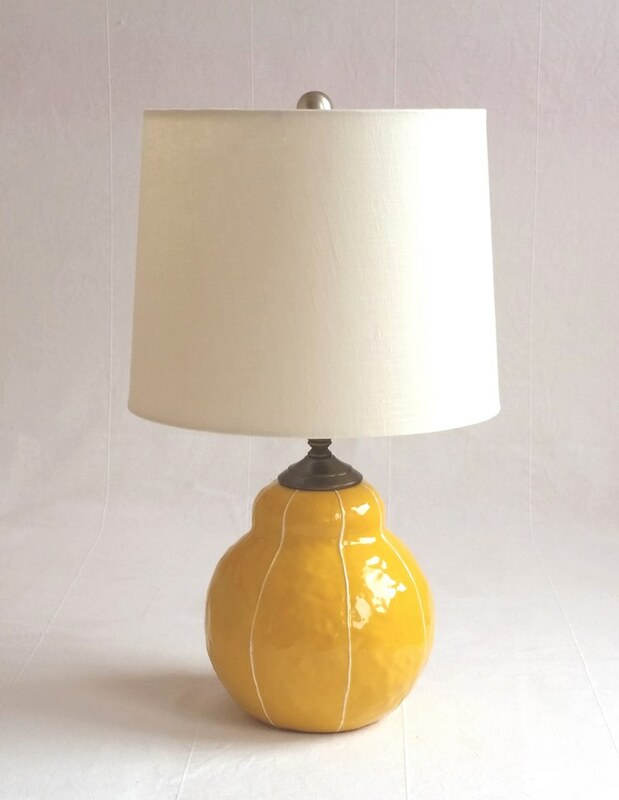 Lamps are not something that people rush in to by by the armful. I held this first open house in the evening so that the lamps could be appreciated and I didn’t offer much else for sale. My aim was to have folks to enjoy each other and I wanted to be able to hang out and get to know my customers better. If you would like to be on my mailing list for the next event (Dec. 6th) Please get in touch with me. I’d love to invite you! 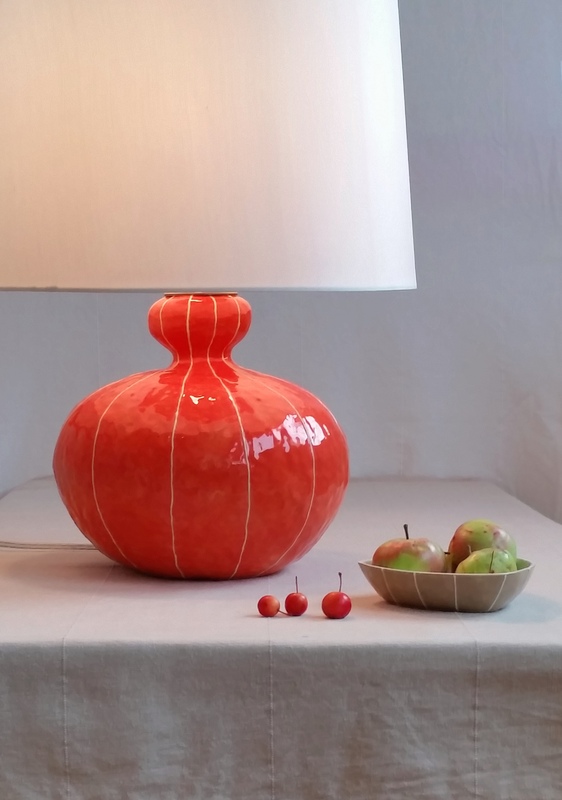 The Tall Gourd lamp continues to be my most popular style in the VIT ceramics lamp range. However, I am very excited about the Bubble lamp. 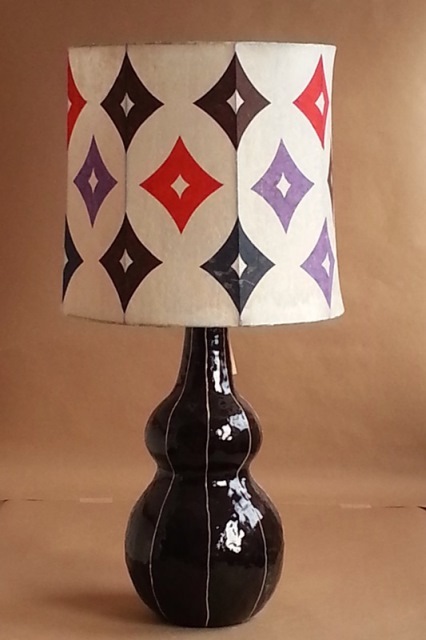 It now comes with a custom, cone shaped shade that I designed. These shades are made just for me in the USA. Have a little fun with this “all American” product! 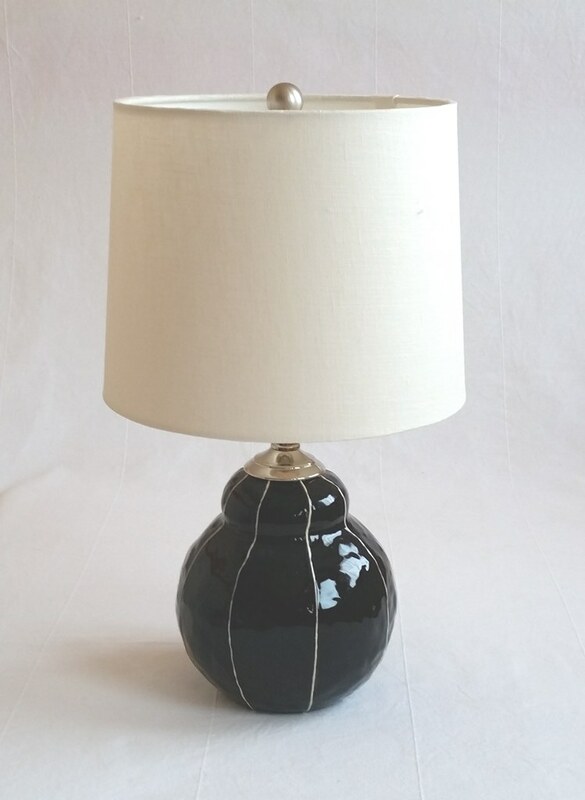 Two new colors have been added to the lamp range; black and celadon. Both these classic colors open new possibilities to your design schemes. 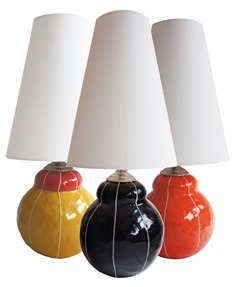 I am always open to developing custom colors for the any of the lamps. The custom projects are an opportunity for me to keep abreast of current tastes and to try something fresh. Found roaming the wilds of Aurora Avenue in Seattle, home of Kri Kri Studio. Vibrant magenta blossoms invade the weeds this this time of year thriving in an environment that seems to provide little assistance. Bringing them in adds life to still shots of bud vases. Must remember: I am shooting vases, not flowers. Natures beauty far surpasses my simple pieces. Yet they do have their place. Now a pink glow radiates from this cluster of vases brightening my day. I found a table… under my table cloth. The table had been lurking around the family for years, employed as a project table for anything that involved paint, glue or in other words, anything messy. 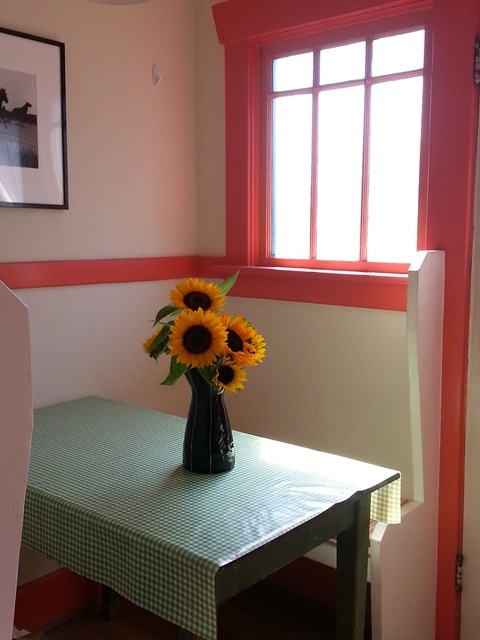 But, it just happened to be the perfect size for the nook at Kri Kri Studio. 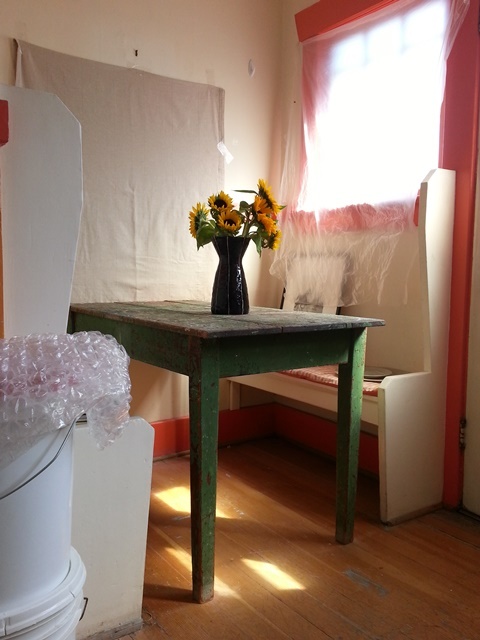 Of course, the first thing I did to it, once it was in place, was to cover it with a perky, oilcloth table cloth. And so it was for many years. Recently, I was preparing for a photo-shoot of the black Eve vase. The nook is a perfect spot. I’ve suspended a rail on the wall for hanging a back drop and hung plastic film over the windows to diffuse the light. Set up also involves ironing the back drops. In the process of all this, the perky table cloth slipped a bit more than usual and I caught a glimpse of the table below. That crusty surface, evolved from years of use was now revealed a a rich patina, perfectly rustic and so inspiring that I spent more of my day shooting than planned. 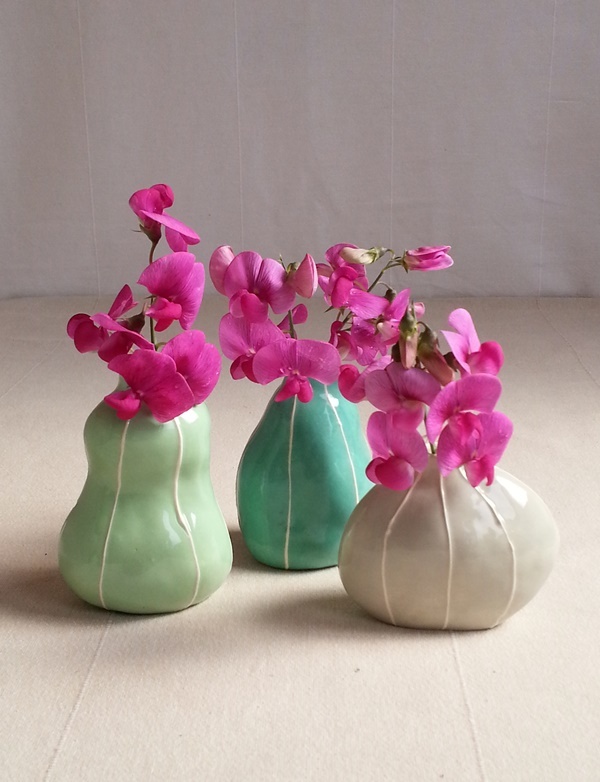 Work became play as I pulled out my VIT dinnerware, then, added bud vases and vibrant fuchsia sweet peas picked in my ally. Isn’t that how it always should be? !